Because we consider you an important customer, our first priority is to offer you exceptional times and stays in our hotel. Your complete satisfaction and confidence are absolutely essential to us. That's why, as part of our commitment to meeting your expectations, we have set up a customer privacy protection policy. This Charter formalizes our commitments to you and describes how Hotel Henriette Rive Gauche uses your personal data. The main rules applicable within our hotel are founded on six principles. By "personal data" we mean any information collected and stored in a format that allows you to identify yourself personally, either directly (name) or indirectly (phone number) as a natural person. Before providing us with this information, we recommend that you read this document describing our customer privacy protection policy. 5. Access, rectification, opposition: You may access, modify, correct or delete your personal data. You may also oppose the use of your personal data, particularly to avoid receiving sales and marketing information. 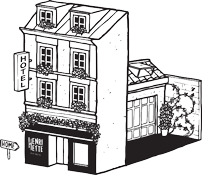 You have the right to access, rectify and oppose any communication of personal information about you by contacting Hotel Henriette Rive Gauche – SARL Hoteliere SCOFFIER – 9, rue des Gobelins 75013 PARIS by email at hello@hotelhenriette.com. • your questions / comments during or after your stay. The collection of information on persons under 18 is limited to their name, nationality and date of birth, which can only be provided by an adult. We would be grateful if you could ensure that your children do not send us any personal data without your consent (particularly via the Internet). • Subscription to newsletters, in order to receive offers and promotions via email. • Online forms (online reservation, questionnaires, Hotel Henriette pages on social networks, network login devices such as Facebook login etc.). • Internal management of lists of customers having behaved inappropriately during their stay at the hotel (aggressive and anti-social behavior, non-compliance with the hotel contract, non-compliance with safety regulations, theft, damage and vandalism, or payment incidents). • Informing you of special offers and any new services. • Offering you the benefits of our loyalty program. • Implementing security and fraud prevention. 9. Conforming to local legislation (for example, storing of accounting documents, keeping Wifi connection data, etc). Hotel Henriette takes appropriate technical and organizational measures, in accordance with applicable legal provisions, to protect your personal data against illicit or accidental destruction, accidental alteration or loss, and unauthorized access or disclosure. To this end, we have taken technical measures (such as firewalls) and organizational measures (such as a user ID/password system, means of physical protection etc.). Hôtel Henriette Rive Gauche – SARL Hoteliere SCOFFIER – 9, rue des Gobelins 75013 PARIS by email à hello@hotelhenriette.com. Hôtel Henriette Rive Gauche – SARL Hotelière SCOFFIER – 9, rue des Gobelins 75013 PARIS by email at hello@hotelhenriette.com.